A programmable molecule in combination with a specific light sequence allows for bond formation (UV and red light; 1. to 4.) or scission (UV and blue light; 4. to 1.) with molecular building-blocks. 15-Aug-2018: Robust plastics are composed of molecular building-blocks, held together by tough chemical linkages. Their cleavage is extremely difficult to achieve, rendering the recycling of these materials almost impossible. A research team from the Humboldt-Universität zu Berlin (HU) developed a molecule, which can drive or reverse specific chemical reactions with light of different colors. This enables making and breaking of connections on the molecular scale, even if they are exceptionally strong. The discovery paves the way for the development of novel recycling methods and sustainable materials. 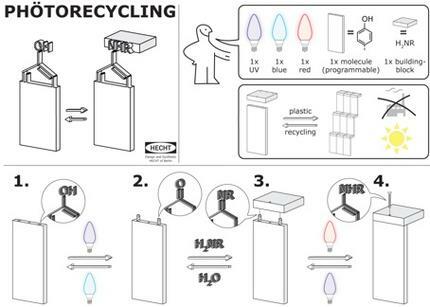 Light-driven recovery of individual molecular building-blocks has great potential to enable recycling of yet non-recyclable plastics without compromising on color, quality, or shape.